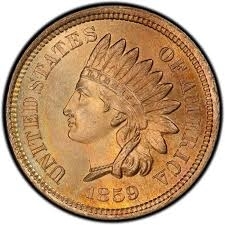 The 1860 Type 1 Indian Head Penny had a combined mintage of 20,566,000. There is no real estimate of how many coins were struck within the type 1 standard. The composition of these coins is 88% copper and12% nickel. The diameter is 19mm. We use strict Photograde standards when grading all of our coins.